Seated Liberty Dimes with Legend and Arrows - A slight increase in weight. 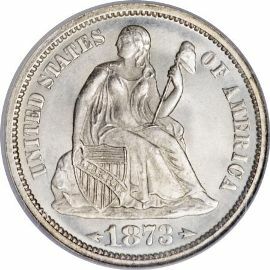 Seated Liberty Dimes, as well as, Quarters and Half Dollars minted between 1873 and 1874, have arrows at the date indicating a slight increase in silver content. The increase was passed through Congress by the Act of Feb 12, 1873. This is the fifth and final design change in this series. 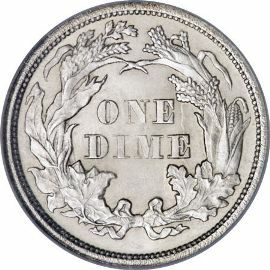 Placing arrowheads on both sides of the date was previously done on half dimes, dimes, quarters and halves from 1853 to 1855. At that time they also indicated a change in weight, but then it was a decrease to discourage hoarding. The obverse of these silver dimes still features liberty sitting upon a rock with a Union Shield in one hand and a staff in the other. The inscription "UNITED STATES OF AMERICA" surrounds the obverse portrait with the date below it. The reverse of this coin has the same "Cereal Wreath" as the previous issue. It consists of corn and wheat stalks, and also oak and maple leaves. The wreath is tied by a bow at the bottom and has the denomination "ONE DIME" within it.